Layer of delicious chocolate topped with a crunchy cashew and hazelnut toffee mixture. Friiiiidaaaaaay! Time for nutty chocolaty chocolate! Um. Also? I thought it would be nice to remind you that Christmas is 5 days away. (!!!) Go ahead, freak out. I just did. Also, are you really seeing this chocolate bark? I’m shocked because I thought I ate all of it. I’m not sure how I finally gave up on inhaling it all just to take a photo of said bark. Wanna talk about something even more shocking? I recently realized that I will never, EVER, everrrr have another Christmas Break ever again. Technically, I haven’t had one since 2001 – I just HAD to finish college. Nerd. Should’ve just taken my sweet ol’ time, but noooooo, I wanted to break freeeeeeeee! Go to work from 9 to 5. Make my own monaaaay! Dork. Moral of the story, if you’re still in school, stay in school. It’s the only way that you can have a Christmas Break, Spring Break (MISS IT! ), Summer Break, even Fall Break! WAAAAAAAH! I hate you! I mean, I love you, I’m just jealous. ‘Tis all. Well. I lived. Them? Not so much. This bark, or toffee, or toffee-bark, is all kinds of amazing. For reals. It’s sweet, it’s salty, it’s creamy, it’s crunchy, it’s chewy, it’s sticky, it’s it’s it’s! So much better than just… bark. Or just toffee. Line a 9x9 brown pan with foil extending over the edges of the pan. Lightly grease with cooking spray. Combine all chocolate chips and layer on bottom of prepared pan. Sprinkle pecans on top and set aside. In a heavy skillet combine cashews, hazelnuts, butter, sugar, and corn syrup. Cook over low heat, stirring constantly, until butter melts and sugar is dissolved. Increase heat to medium and continue to cook, stirring constantly, until mixture clings together and turns golden brown, about 8 to 10 minutes. 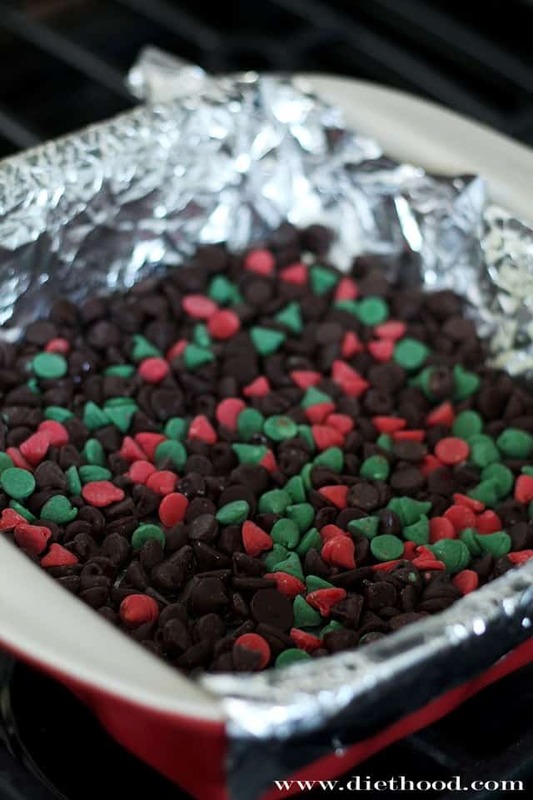 Pour mixture over chocolate chips and pecans and spread it evenly. Oh Katie this is like perfection!! 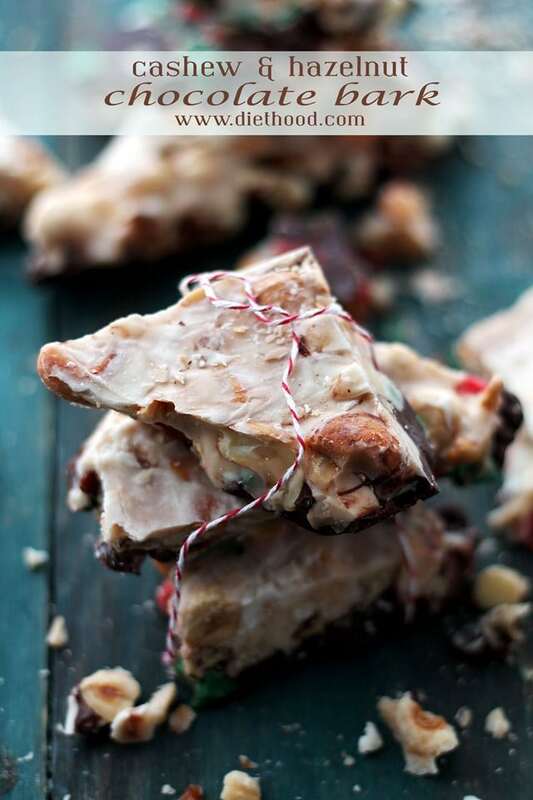 I love how you took bark and put your own twist on it! Fabulous!! 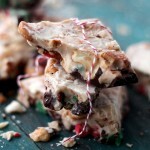 Oh I need this bark in my life, what an addictive treat! Be still my heart! All my favorites in one place! Thanks – or not! I love Christmas and all the food around it! Hello, deliciousness! I love the nut combo in these…a little unexpected but delicious! What an amazing bark!!! Love the cashew and hazelnuts! Looooove it! Gotta make it so I can nibble on it this weekend! This is the best Christmas bark I’ve ever seen! I love how chock full of things it is! Love! Yeah with the blog and such breaks are kinda nonexistent. But I’m thankful I don’t have to leave the house when it’s all gross and snowy out. Plus it means having amazing things like this bark around! 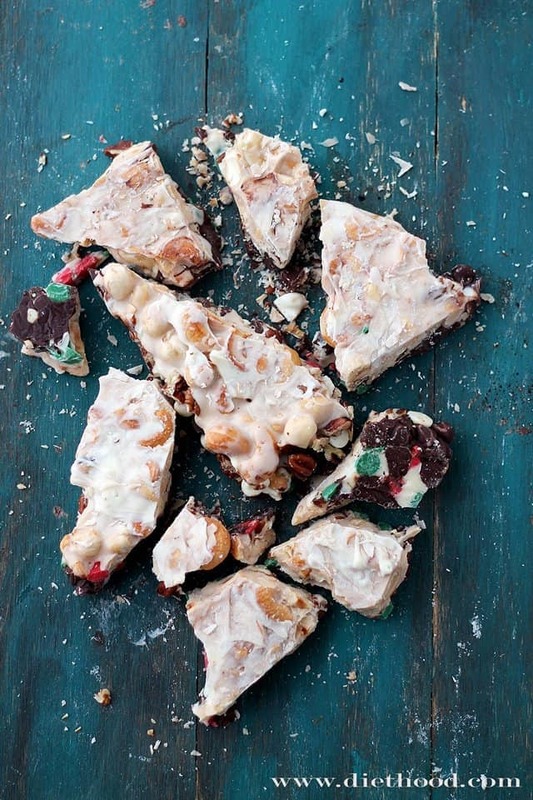 The nutty chocolaty bark looks really pretty and festive and sounds sooo delicious. Merry Christmas!